Having heard about this book from some people, and having my curiosity piqued by it's interesting title, I picked up this short work and read it, only to later put it down in stupefaction. Beware! Nee's so-called Biblical basis for believing in the latent power of the soul was shockingly speculative and lacking substantial warrant. He claims that Adam must have had supernatural powers, for how else could he have been able to tend to the Garden? On the basis of this reasoning Nee constructs the rest of his book, warning Christians about the latent power of the soul - supernatural powers - that still exists within all humans. Nee attributes the supernatural behavior of Hindus and Buddhists to this latent power of the soul, and states that while God created this power, we no longer have the warrant to utilize it, but Satan wants us to use it to further his ends. Needless to say, with a premise like this, the remainder of the book is chaotic. Nee is typical of many "deeper life" writers in his day who quote Scriptures to make certain points, points which are out of context and actually alien to the entirety of Scripture. For some reason these writers were incapable of seeing what they were doing, and wrote with an air of authority which they thought stemmed from God's Word but did not. Nee has written some good books which shouldn't be discarded because of this one, but I would never recommend this book of his. It only serves to promote superstition. Nee's warnings about functioning out of the flesh are in great need. I don't think his statements are that shocking or that speculative. Your reaction to this work seems extreme since you couldn't point out anything unbiblical, nor how it could directly mislead christians today. I can think of many reformed preachers you esteem whom also acted with an authority and said many erroneous things. But I'm not suprised from following your blog thus far that it would end in you knocking Nee. Thanks for your comment. I'm not knocking Nee, but Nee's book 'The Latent Power of the Soul'. I found it disturbingly unBiblical since, as I wrote above, it was based upon a speculative foundation. The entire premise was Nee's idea that Adam must have had supernatural powers because otherwise he could not have tended to the Garden of Eden. Apparently the task was too much for him without supernatural abilities such as flight. Based upon this idea, Nee proceeds to write the rest of the book. I also questioned his idea that we have the power to pray toward ourselves and other people (not God) and achieve miraculous results, by quoting Matthew 6:27. So I did highlight and address some things I deem wrong. I think Nee has written some good books. 'Sit, Walk, Stand' on Ephesians is good, as well as much in 'The Normal Christian Life'. I get excited whenever I find in Nee those clear explanations of righteousness through faith that are often missing from Christian books. In this he is to be commended. The entire premise was not simply the idea that Adam tended the garden of Eden. He also named all the animals of the earth. Both of us have names that existed before, but Adam made names from scratch, something few people can manage to do even for one or two children! And yes, you knock Nee when you generalize him as a "deeper life" writer and with those who, "were incapable of seeing what they were doing, and wrote with an air of authority which they thought stemmed from God's Word but did not." Keep in mind Nee wrote over 100 books and died in prison for his faith. He is the father of many who believe, and a founder of the underground church in China. Though this particular work of his might be harder for you to swallow, I would be weary of travelling down the road you venture. I should have clarified: "Nee, in this book, is typical of many "deeper life" writers..."
I love this book! He does explain how the supernatural is so prevalent in Africa and many other countries in the world through false religions. This is something we barely deal with unfortunately in North America so the thinking is foreign to us. Sadly we think from the persecutive of our context locally in the world. I don't deny that the supernatural is prevalent in other parts of the world. I simply deny Nee's explanation as to why that is. I believe Nee's premise is erroneous, that Adam had need of supernatural abilities in order to tend the Garden of Eden. Rather than basing one's doctrine upon a speculation like that, it would be better to attribute the supernatural prevalence in those parts of the world to the activity of Satan and of God, and to the different ways people think. I've heard so much about Nee and his deeper spirituality and I do believe he calls us to a deeper commitment. Therefore I love him. We can all acknowledge that where there are many words, sin is not absent. With that in mind I always glean truth from all preachers and teachers words. Nee calls attention to an aspect of man that has and is long ignored by the greater majority. This power of the soul, I think, most people who come to this page will attest to. However, I do not think that the power of the soul is in and of itself evil, as I do not think that the power of the mind of body/flesh is in and of itself evil. It is sin that corrupts and pollutes. I do not agree with Nee that the first Adam was a superman, per se. I do think that when God commanded Adam to take dominion, it was referring to man in general. Since there is no scripture enlightening us on this clearly, we can only postulate, given our own limited perspectives. Though I don't agree with him in some crucial points of his teaching I do agree with his teaching of the, in my opinion and experience, not so latent power of the soul. Bring everything into subjection to Christ. Thanks for sharing your objections to this beautiful Christians book, it confirmed my own. I found this review on 3/4/19 and note that most of the reviews are from June 2014. I read this book and believe it has much to offer for those intercessors who have been led into some of the "deeper things" of God. The Lord is widening our horizons and challenges us to consider broader perspectives in this season. But the Holy Spirit is our teacher who promises to lead us and guide us into all truth. So, we can embrace that promise and expect He will give us light. I have been praying about the spirit that moves in Freemasonry. There are some dark things there and I believe the Father wants to take us on a journey to learn His ways of spiritual warfare to see victories of engaging, confronting, and overcoming Satan's opposition in this catagory. 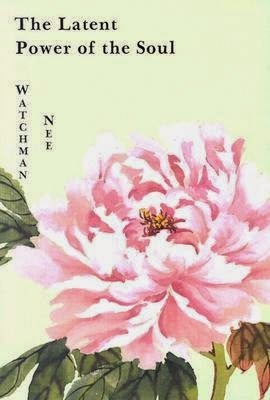 I found much of Nee's book to be enlightening and useful as an intercessor. Sometimes God's ways are higher than ours. His thoughts are higher. We simply need to acknowledge that the framework we are currently looking through may not be adequate for the task at hand. I am a civil engineer. If you know physics you know of Newtonian physics, and how Einstein's Theory of Relativity took us beyond Newton. Newton fit inside of relativity but was not sufficient to explain more. I think that is similar analogy for the Latent Power of the Soul. Nee brings new dimensions to the table. They broaden the discussion. Deepen it. Strengthen it.